This is the code for the celebrated Sperner's Lemma in two dimensions --- which is equivalent to Brouwer Fixed Point theorem. Incidentally, it's my first program without any help --- until I ask this question. 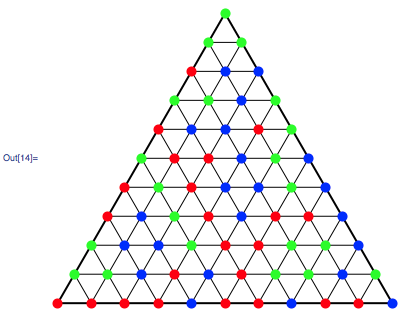 In a triangle with colored vertices, each point on a edge has a random color drawn form the two color of the corresponding vertices and each interior point resulting from the triangulation of the first triangle has a random color drawn from the three vertices colors. The there exist at least one subtriangle with three color vertices. the three colors triangle must have a specific color. if one interpret an edge segment with two colors as a door, there exist always a path for this specific type of door from one edge to a three color sub-triangle, which ever be the starting edge --- a path could also lead to an exit. How to dynamically show the paths. It will be nice to take the move the edges and vertices external points to make a keeping property transformation. My difficulty with the first and the second point is to freeze the colors --- in such a way to know which are the three colored triangles. One can colorize a path with a light color or draw a line from barycenter to barycenter.. I have no idea how to program the third item. PS I could not be very reactive since where I am I get access to internet sporadically. Browse other questions tagged programming topology or ask your own question. Can Mathematica help a theorem to be alive? What is a good coding style for setting and changing application level constants?